I’m counting down the days for my first Ecological Society of America (ESA) conference next week in Portland, OR. Over the last few weeks, I’ve been diligently working to finish as much analysis as possible on the data from my recent post-doc, as I am presenting a poster on Wednesday, August 9th from 4:30 to 6:30 pm; PS 31-13 – Soil bacterial diversity in response to stress from farming system, climate change, weed diversity, and wheat streak virus. Several of my new colleagues will also be presenting on their recent work, including a talk from Roo Vandegrift on the built environment and the microbiome of human skin, and one from Ashkaan Fahimipour on the dynamics of food webs. The theme for this year’s ESA meeting is “Linking biodiversity, material cycling and ecosystem services in a changing world”, and judging from the extravagant list of presenting authors, it’s going to be an extremely large meeting. It’s worth remembering that large conferences like these bring together researchers from each rung of the career ladder, and many of the invited speakers will be presenting on work that might have been done by dozens of scientists over decades. Seeing only the polished summary can be intimidating, lots of scientists I’ve spoken to can feel intimidated by these comprehensive meeting talks because the speakers seem so much smarter and more successful than you. It’s something I jokingly refer to as “pipette envy”: when you are at a conference thinking that everyone does cooler science than you. Just remember, someone also deemed your work good enough to present at the same conference! My greenhouse trial on the legacy effects of farming systems and climate change has concluded! Over this past fall and winter, I maintained a total of 648 pots across three replicate trials (216 trials per). In the past few weeks, we harvested the plants and took various measurements: all-day affairs that required the help of several dedicated undergraduate researchers. In case you were wondering why research can be so time and labor intensive, over the course of the trials we hand-washed 648 pot tags twice, 648 plant pots twice, planted 7,776 wheat seeds across two conditioning phases, 1,944 wheat seeds and 1,944 pea seeds for the response phase. 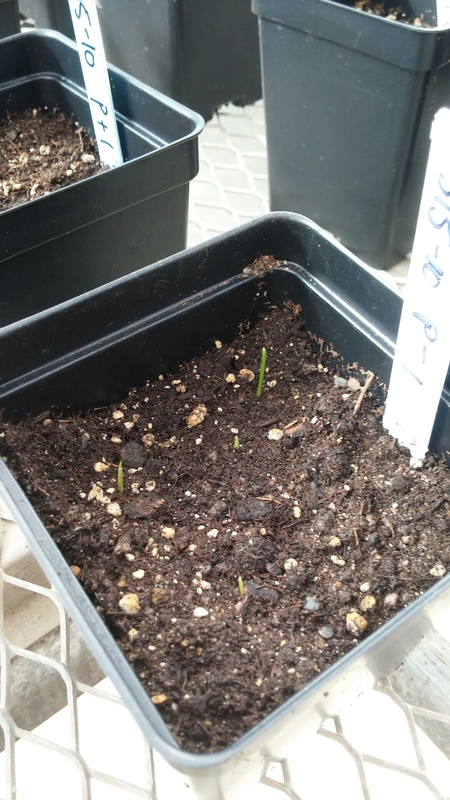 We counted seedling emergence for those seeds every day for a week after each of the three planting dates in each of the three trials (9 plantings all together). Of those 11,664 plants, we hand-plucked 7,776 seedlings and grew the other 3,888 until harvesting which required watering nearly every day for over four months. At harvest, we counted wheat tillers or pea flowers, as well as weighed the biomass on those 3,888, and measured the height on 1,296 of them. And this is only a side study to the larger field trial I am helping conduct! All told, we have a massive amount of data to process, but we hope to have a manuscript ready by mid-summer – stay tuned! Field bindweed (Convolvulus arvensis) is an invasive plant related to morning glories. Their winding vines grow into a tangled mass which can strangle other plants, and a single plant can produce hundreds of seeds. The plants can also store nutrients in the roots which allow them to regrow from fragments, thus it can be very difficult to get rid of field bindweed. It will return even after chemical or physical control (tilling or livestock grazing), but it does not tolerate shade very well. Thus, a more competitive crop, such as a taller wheat which will shade out nearby shorter plants, reduce the viability of bindweed. Bindweed wraps around other plants. This patch goes all the way to Lazarro. First seen in the US in 1739, Field bindweed is native to the Mediterranean. By 1891, it had made its way west and was identified in Missoula, Montana. As of 2016, it has been reported from all but two counties in Montana, where it has been deemed “noxious” by the state department (meaning that it has been designated as harmful to agriculture (or public health, wildlife, property). In the field, this can be visually striking, as pictured below. In the foreground, MSU graduate student Tessa Scott (lead researcher on this project) is standing in a patch of wheat infested with bindweed. Just seven feet away in the background, undergraduate Lazarro Vinola is standing in non-infested wheat, with soil core samplers used for height reference. In agricultural fields, bindweed infestations severely inhibit crop growth and health. Last week, Tessa, Lazarro, and I went to several farms in and around Big Sandy and Lewistown, Montana in order to sample fields battling field bindweed. To do so, we harvested wheat, field bindweed, and other weed biomass by cutting all above-ground plant material inside a harvesting frame. These will be dried and weighed, to measure infestation load and the effect on wheat production. The sampling locations are consistent with previous years to track how different farm management practices influence infestations. This means using GPS coordinates to hike out to spots in the middle of large fields. It also means getting very dirty driving and walking through dusty fields! Thalspi, or pennycress, which is dropping seeds even in my shoes! The van did very well on rocky, uneven field roads!